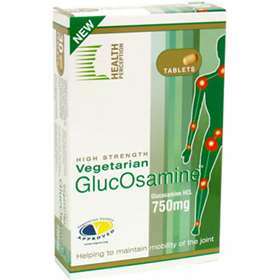 Vegetarian High Strength GlucOsamine 750mg helps maintain mobility of the joints. Glucosamine is a naturally-occuring, non-toxic biochemical constituent. Connective tissue in and around the joints is constantly renewed. Structures such as cartilage, tendons and ligaments rely on an amino sugar, Glucosamine, for this continuous rebuilding. Glucosamine is formed in the body from glucose and glutamine. Both of these components are derived from dietary sources. Glucosamine is a convenient and readily absorbed form of Glucosamine Sulphate which also contains vitamin C, calcium plus magnesium which has shown to enhance the bioavailability of supplemented nutrients through increased absorption. Free from preservatives, yeast, sodium salt, lactose and gluten. Take one tablet twice a day with meals. Do not exceed the recommended intake. Pregnant and breast feeding women should not take the product except on advise of their doctor. Product code: 3101342 Price: £8.99 (incl VAT) Sorry, this item is currently unavailable. Click here to receive notification when this product comes back into stock.